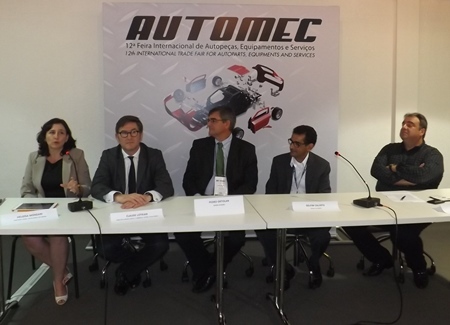 During Automec, the most important professional exhibition in South America for auto parts, workshop equipment and service, TecAlliance presented the Brazilian TecDoc WEB CATALOG. At a press conference on 8 April 2015 in São Paulo Claude Lotrian (Director Western Europe & Latin America) and Heloísa Monzani (Regional Sales Director Brazil) informed the representatives of the press about the version of the TecDoc online catalogue developed especially for Brazil and about TecAlliance’s planned activities to play a greater role in the Brazilian market. From left to right: Heloísa Monzani (Regional Sales Director Brazil, TecAlliance), Claude Lotrian (Director Western Europe & Latin America, TecAlliance), Pedro Geraldo Ortolan (Sales and Marketing Aftermarket Director, MANN+HUMMEL), Delfim Calixto (Aftermarket Vice-president Latin America, Bosch) and Antonio Fiola (President, Sindirepa) at the press conference on 8 April 2014 in São Paulo. So far 25 part manufacturers have been won as data suppliers for the Brazilian TecDoc WEB CATALOG. At Automec, which ran from 7 to 11 April in São Paulo, these data suppliers identified their exhibition stands with the “TecDoc Certified Data Supplier” logo, informed stand visitors with flyers about the new offering and held live demonstrations to give a first view of the possibilities of the TecDoc WEB CATALOG. In addition to the current data suppliers many others, including Brazilian part manufacturers, showed great interest and will start delivering data in the coming months. Already since July 2014 TecAlliance customers in Brazil have had a local contact person in Heloísa Monzani. In order to be close to Brazilian customers and act efficiently, a Brazilian office will be opened so that additional employees can be hired in the course of the year.